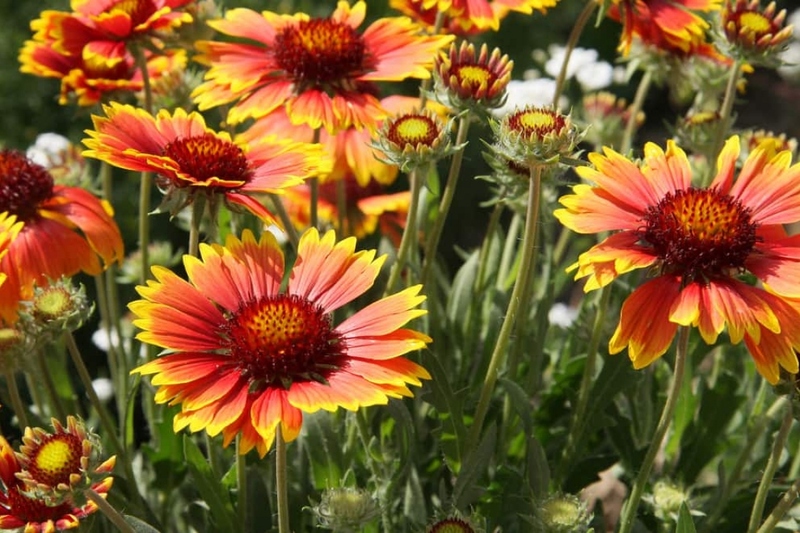 Gaillardia (Gaillardia): growing, planting, caring. Gaillardia - blanket flower - is a genus of flowering plants in the sunflower family, Asteraceae, native to North and South America. It was named after an M. Gaillard de Charentonneau, an 18th-century French amateur botanist. Some species of Gaillardia are annual, others biennial, and others are perennial. Beware! Of the same family as the asters, the gaillardes have the same general shape : their leafy stems measure up to 1m, and at the top perches large inflorescences in multicoloured capitules. The leaves are generally elongated, green to silvery. The flowering happens in the summer and can sometimes last until fall, and it easily attracts bees and butterflies. Common blanket-flower sow easily in May or June, from seeds that you can easily recover at the end of flowering. Give them a sunny position, ideally in a well-drained soil, keeping a distance of 30 to 40 centimeters between each foot. Perennial common blanket-flower do not appreciate wet soils in winter, so provide them with drained soil, or add sand to the plantation. Plants in April-May, when the frosts are over. Prepare the soil by loosening it with a pitchfork and breaki up the clods. Plant and pack around the plants to bring the soil in contact with the roots. Water well after planting! Water twice a week after sowing until planting. Then, you will still have to water twice a week during the first month after planting, afterwards your blanket-flower should fend for themselves. If your blanket flower shows fungal-related damage - felting on leaves most of the time - it's because the soil is too wet for them. You should consider moving them in this case.